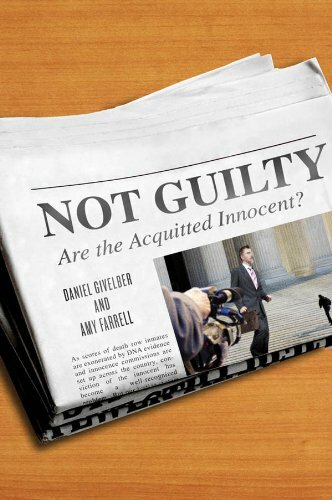 Law and Politics Book Review: NOT GUILTY: ARE THE ACQUITTED INNOCENT? NOT GUILTY: ARE THE ACQUITTED INNOCENT? By Daniel Givelber and Amy Farrell. New York and London: New York University Press, 2012. 187pp. Cloth $35.00. ISBN:978-0-8147-3217-5. Reviewed by C.L. Segal, University of Texas-Arlington (retired). NOT GUILTY: ARE THE ACQUITTED INNOCENT? by Givelber and Farrell should have used ‘looking at Kalven and Zeisel’s classic study 50 years later’ as its subtitle. They never expressly answer the subtitle’s question or even discuss the issue. The authors rely upon National Center for State Court data to reach their comparisons and conclusions between juries and judges. References to the findings of Kalven and Zeisel are found throughout the book. Interestingly, 50 years have apparently displayed few major differences in how judges and juries make decisions. These decisions continue to be reached in much the same manner, according to data presented by Givelber and Farrell. Givelber and Farrell emphasize data that showed how often judges agreed with jury findings. There was more agreement with guilty verdicts than with acquittals. Judges and juries disagreed about the strength of 40% of cases and data showed that juries were likely to acquit in 45% of cases of disagreement. There is need for further study into the reasons for this deviation. The authors believe that there is a racial cast to these findings, but here, as throughout the book the argument is underdeveloped: they offer no reason in support of their hypothesis. Judges indicated that they were more likely to convict Blacks at a higher rate than those of other races. Judges were also more frequently in agreement with jury verdicts of acquittal when defendants were White or Hispanic rather than Black. The authors conclude that the jury and not the judge has greater success in treating defendants of all races comparably. No explanation is put forth to help understand this phenomenon. While judges are listening to the evidence to determine sufficiency, they are not necessarily listening to resolve credibility issues. Jurors, in contrast, are reported to weigh witness credibility very heavily. It often is the subject of extensive deliberations and the basis of the verdict. The NCSC data that was analyzed by the authors found that in only 11% of the cases did judges and juries agree on not guilty verdicts. This is quite a large discrepancy when compared to the agreement when there is a finding of guilt. Once again the authors do not put forth any hypothesis or rational for this. It is hard to understand why the authors omit mention of the influence of the media in comparing jurors today and those who sat as decision-makers 50 years ago. I do not mean to imply that [*70] the media influences whether a defendant is found guilty or acquitted. Rather, because of the large number of criminal related programs, jurors today are usually knowledgeable about a courtroom and the various players involved in a case, criminal or civil. A cable show called “Court TV,” which is no longer broadcast, used to employ “talking heads” to discuss the sufficiency of the evidence and witness credibility. The OJ Simpson case was dissected for days on end. body language and hostile witnesses. They also learned about cross examination by the prosecutor as well as defense counsel. DNA evidence played a prominent role in the Simpson case and may have been a factor in the final verdict. What remains in my memory about the case involved a glove found near the bodies. In addition the public, who became educated about DNA, now expect to hear about this type of physical evidence in all future cases. Today’s media has a plethora of programs where suspects become defendants and are found guilty as the shows end. Additionally, most television programs include references to CSI. It is rare for a crime scene investigator on a television program not to reference DNA. These trends – subconsciously, at least – set the stage for a juror to give extra credence to prosecutorial evidence, since DNA evidence is presented as infallible. Jurors, conditioned by television shows, have come to expect the use of forensic evidence and the lack thereof can influence their verdict. This becomes apparent in post-verdict televised interviews with jurors. Givelber and Farrell tell us that judges look to the sufficiency of the evidence, but they do not explain its type or classification. Do judges and juries weigh DNA testimony differently? This is never alluded to nor discussed. Little discussion is given in the book to the type of forensic evidence presented. It is probable that the NCSC data used did not readily provide detailed information. There is however an extensive bibliography and more than 30 pages of end notes. Givelberger and Farrell might have had a better book if at least some information from the end notes had been worked into the narrative. The authors do mention witnesses and expert testimony but with hardly any conclusions about the effect of this testimony on either the judge or the jury. Maybe a future graduate student will explore this topic. The authors do not discuss the differences in expert witnesses today and 50 years ago. Was more weight given to expert testimony 50 years ago when its use was undoubtedly rare? Since both judges and juries give much attention to prosecutorial evidence, I find omitting data about this type of testimony to be a [*71] major failing of the book. Although research into the unreliability of eye witnesses is extensive, nothing about this type of prosecutorial evidence is discussed. In point of fact no mention is made of any type of prosecutorial evidence. The only mention of prosecutorial evidence is in relation to the judge’s weighing of the sufficiency of the evidence. Givelber and Farrell do look at the effect on a defendant’s case in terms of whether witnesses were called and if the defendant took the stand to declare his or her innocence. Table 5-1 on page 104 can be read to find this information, as well as the outcome of its use by both judge and jury based on whether the defendant testified. The table also reveals the outcomes when a defendant testifies as the sole witness as opposed to when there are corroborating witnesses. The table itemizes this data in relation to different crime types. Attention is also paid to the prior criminal history of the witness. Records from four different areas of our country were used: Arizona, New York, California, and Washington D.C.
Because of the rules of evidence, a defendant’s prior criminal history can only be introduced when impeaching the defendant’s credibility. Thus a judge hearing a case without a jury will know about the defendant’s criminal history and may, consciously or not, factor it into the sentencing decisions. The jury will rarely be so knowledgeable. Defense counsel will usually advise a client not to take the stand in order to avoid prior convictions being revealed and used as impeachment weapons. In spite of shows like “Exonerated,” the average individual usually cannot relate to an innocent person’s being found guilty. In 2008, 60 minutes featured a segment about how the Texas Innocence Project was responsible for the release of 17 men from Texas prisons based on DNA evidence. An innocent inmate’s potential release is often dependent upon the storage protocols used by various police departments. Improper storage can result in degraded DNA evidence. Headlines are produced when an innocent person walks out of prison. This recently occurred when a former grocery store employee who had been convicted of killing his wife was released after 27 years behind bars for a crime he did not commit. Supposedly the prosecution withheld exculpatory evidence. Angela J. Davis wrote an excellent book about prosecutorial discretion. (ARBITRARY JUSTICE: THE POWER OF THE AMERICAN PROSECUTOR 2007.) She reminds readers that in UNITED STATES V. ARMSTRONG (1996) the United States Supreme Court found unlimited prosecutorial discretion to be constitutional. According to Davis, withholding exculpatory evidence is not as rare as one might hope. Givelber and Farrell’s emphasis revolves around the difference in case outcomes with judges in a bench trial and those involving a jury. Both the weakness of a prosecutor’s evidentiary presentation and jury nullification were glossed over as outcome predictors. Part of this may be attributed to the reliance on NCSC data and not to actual trial presence. Its absence, however, weakens the value of the book. In the Preface, the authors write “Jurors were convicting the guilty except where there was a good reason for them to ignore the formal demands of the law and acquit.... Acquittals represent a one-time failure by the prosecution to persuade a jury of guilt beyond a reasonable doubt rather than a positive indication that the defendant did not commit the crime.” Jury nullification occurs when the jury believes that following the letter of the law will result in injustice. With very few exceptions, no one other than the jurors know the reason behind an acquittal. While some jurors will speak with the media after the verdict is announced and the jury has been dismissed, most will not do so. In sum, this book shares some interesting data, but the analysis seems underdone. Fifty years after Kalven and Zeisel, the typical juror is different, and has a different background through the media. The book’s shortcomings make it difficult to recommend: For the reader with some training, the book will raise lots of issues, but in a frustrating manner. For the reader without an understanding of the workings and biases in the criminal justice system, the book is too incomplete to be a starting point. Kalven, Jr. Harry, and Hans Zeisel. 1966. THE AMERICAN JURY. Boston: Little, Brown and Company.